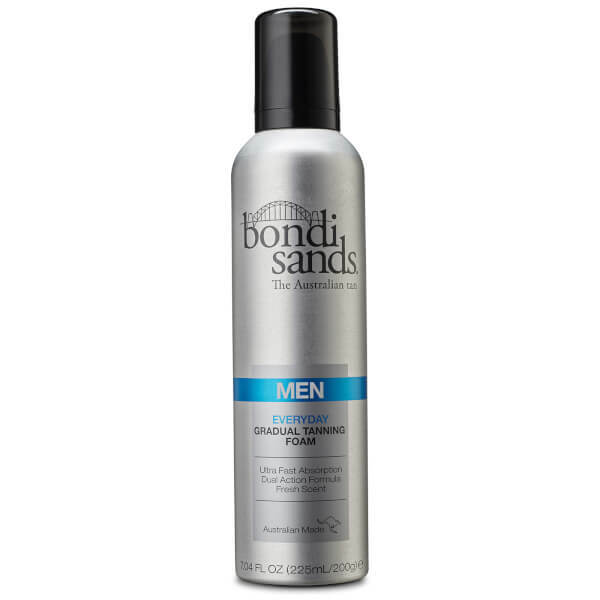 Catering specifically for men, the Bondi Sands Everyday Gradual Tanning Foam delivers a healthy-looking glow and fresh masculine scent. Lightweight and non-greasy, the quick-absorbing foam produces natural, long-lasting colour that slowly intensifies and can be used daily. Simple and easy to use, the fuss-free gradual tan develops over 1-3 applications and doesn't leave behind sticky or greasy residue. Step 2: Apply Bondi Sands Everyday Gradual Tanning Foam evenly onto the skin in circular motion. Wait until touch dry before dressing. Water (Aqua) Alcohol, Butane, Isobutane, Propylene Glycol, Propane, PEG-60 Hydrogenated Castor Oil, Dihydroxyacetone, Polysorbate 20, Ethoxydiglycol, Fragrance (Parfum) Erythrulose, Tocopheryl Acetate, Bisabolol, Farnesol.